This is a complete listing of every Blaine made from 1999 until the present. I will include Name, Model # (M#), Box Date (BD) and Hair Color (HC). I am adding Clothing (C) and Accessory (A) descriptions as well. Highlighted boxes are the Blaine dolls I keep. A great place to jam with my friends! Guitar, because music's my life! A worldwide sensation with my own band! "Music makes the world go 'round"
Since the introduction of Jamal® from the "Shani" line in 1992-1993, it has been 8 long years since Mattel added another adult male character to the Barbie® friends and family tree. Ken®'s little brother Tommy was introduced in 1997 in the Kelly® line, but he was just that; little. Collectors were craving a new character to mix in with Ken® and Steven®. Hopes ran high at the beginning of last year with the announcement of "Zach", a new male friend of Skipper®. Joining her in the "Totally Yo-Yo" line, Zach doll's face was prominently pictured in Mattel literature and major Barbie® publications. Skipper® didn't have a male friend since Kevin® left in 1995. Would Zach use the Kevin® body mold? If so, a line of clothing would certainly have to be created along with him. Collectors from every spectrum of the Barbie® lines took notice and embraced the notion of a new male doll. Unfortunately, Zach never made it to production, and most of us were left feeling a little let down. Speculations ran rampant about his demise. Some claimed his face mold looked too old to be in the Skipper® line, while others blamed it on cut in production levels because of financial stress. Regardless of what really happened, Zach was quietly dismissed. Even though he was never produced, like so many of his male predecessors, he would be remembered. The switch was on! Think of Brad® equals Curtis® or Derek equals Dude. Zach, or at least his head mold, equals Blaine. Zach, reincarnated as Blaine, looks the same, but there is a total image makeover. Not only is there a few year age increase, his new "grown up" body mold makes him the same size as Ken®. Comparisons between the transformations above always equaled out. 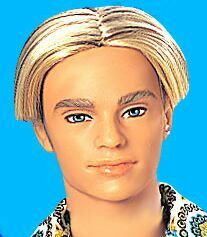 The Zach to Blaine story transforms a boy to a man, similar to Todd® doll's story. A new cooler attitude instantly makes him popular! Separate Generation Girl Fashions are already designed just for him, but are currently unavailable. Of course with the different body mold he could borrow Ken® doll's clothes too. What more can you ask for? Above: Blaine™ doll's beginnings. "Totally Yo-Yo Zach" pictured here with "Totally Yo-Yo Skipper®. Unfortunately for the male doll collector, Zach never made it into production. With the creation of the Generation Girls, a group of "International High School" teen age girls, roles and role models were clearly defined from the beginning. The First Edition of the Generation Girl line introduced us to a much younger version of Barbie® we haven't imagined for a while. Barbie Roberts was in High School again, not in Willows WI, but in NYC. This time she is behind the camera, as an amateur photographer and actress. The "Shani" line African American Nichelle Williams (New York, NY) a fashion model is brought back from 1993 to add in the mix. Joining both of them are a brand new cast of International High School girlfriends. Tori Burns (Australia) is a champion snowboarder and in-line skater, Ana Suarez (Mexico City, Mexico) athlete, Chelsie Peterson (London, England) singer and Lara Morelli-Strauss (Paris, France) an artist. The Generation Girl line is reminiscent of Barbie® and the "Rockers". A group of characters specially created for a specific theme. Also because there is more than one edition, and international flavor. A line of books made the characters come to life in situations following their talents and aspirations. The Second Edition of the Generation Girl line adds two new characters and transfers two others to different schools. My guess is that Mattel listened to their #1 consumer, which is reminiscent of 1961, when little girls demanded a boyfriend for their Barbie® doll and Ken® was created. How can you have a High School setting without any boys around? When Ana and Chelsie® are "transferred", Mari Nakano (Tokyo, Japan) and Blaine Gordon (New York, NY) fill their vacancies. Mari likes video games and karaoke while Blaine's interests include in-line skating and music. The big news of course is Blaine. Packaged in the signature Generation Girl black box with pictorial sides, the theme centers around the International High School's "Spring Jam"...a dance party. Blaine's box is marked Generation Girl Dance Party. The "cool facts" on the box back are listed between the pictures to the left. Blaine is back in the third installment in 2001. The "My Room" line showcases the dolls in their bedrooms. [See related story Ken News/Generation Girl My Room Blaine] Ana is added back to the line and Chelsie® is permanently removed from the line as her parents move to China. M#: 26111 BD: 1999 HC: Two Tone Rooted Blonde/Brown (Side Part). C: Black pants. Turquoise batik print shirt worn un-tucked. Silver vinyl jacket l/s. Silver watch on right wrist. Backstage pass with star charm is worn loosely on a black cord around neck. Bead necklace. Pair of silver sunglasses a top of head. Black lace-up shoes with white thick sole. A: Miniature black/gray turntable with set-up stand and two records attached. Black/gray headphones with wire. Two more records. Four cardboard record sleeves. Orange plastic record storage box. Black cell phone. Sleeveless blue heather shirt with appliqué. Black two piece doll stand with Generation Girlsticker. Light blue sparkly body glitz. Generation Beat Magazine. NOTE: There have been three different versions of Generation Girl "Dance Party" Blaine found. All three are pictured in the picture link. One box variation includes light blue sparkly body glitz, the other two do not. One also includes a free Generation Girl Chapter Book. M#: 50160 BD: 2000 HC: Two Tone Rooted Blonde/Brown (Middle Part). C: Cream cord with aqua stitching jam length (below knee) shorts with attached black video phone with Lara sticker. White retro print shirt with black, aqua orange l/s. Black cord choker. White tennis shoes with black sole and side stripes. Pair of clear yellow sunglasses a top of head. A: Blue and white electric guitar with sticker and cord. Cord from guitar is plugged into rose color amplifier. Blue chair. Red fuzzy pillow. Three cardboard music designed notebooks (folded). Two cardboard sheets of music. Cardboard expanding "studio" wall. Generation Beat Magazine. NOTE: Inner portion of box transforms into room wall that may be attached to the expanding studio. Box back shows a blue fuzzy pillow instead of the red one that is included. 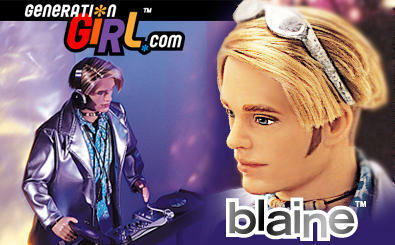 Introduced at Toy Fair 2004, Mattel announces that Blaine is back in the play line, although he has a whole different background, and is being introduced into the expanded Cali Girl™ line! The new Cali Guy™ Blaine® doll comes with a lot of facts about him that are listed on the box text and in the "Cali Girlzine" magazine, including "He's a risk taker who loves to rip the waves on his boogie-board". Cali Girl™ Blaine appears on store shelves late June 2004, in the second wave (editions) of Cali Girl™ dolls. The first wave featured editions of Barbie, Cali Girl Ken, Lea, Teresa, Christie and Cali Girl Steven. Second wave dolls are Barbie, Teresa, Christie, Blaine and another new doll "Summer" who happens to be Blaine doll's sister. This is explained in the Cali Girlzine-Ken or Blaine? magazine, that says he's "The most amazing hot new guy in town. The brother of Summer®, he has lots of charisma and attitude". These second edition dolls feature existing molds that have been enlarged. They still have the correct earlier dates/markings on the backs of their heads, but they are obviously larger. These dolls will preview this slight change that will be apparent on all 2004 play line dolls. Mattel uses one of the best Ken® head molds (2001 Ken® Collectibles) for the new Cali Girl™ Blaine doll. 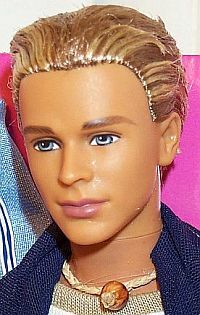 And it looks as though Cali Girl Ken® doll will have some competition from Blaine doll, as a summer romance between Blaine and Cali Girl Barbie® will be explored (See Feature Story Archive 02.12.04). 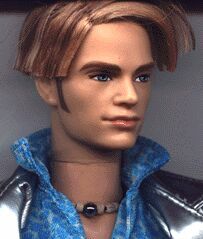 ABOVE: Blaine™ doll is the new guy for Barbie®, winning the popular vote at Barbie.com. To promote the line, voting was conducted at Barbie.com to choose who Cali Girl™ Barbie® will date . Five different choices were available: Life partner Ken®, who's portrayed as "sweet and fun, loves to surf", Steven™ "Super easygoing, into nature" or newcomers Blaine™ who is "So totally cute, great at sports" or Diego™, "Terrific swimmer, digs new adventures". All four guys appear in the "Cali Girlzine"! It's no surprise that Blaine™ doll won the popular vote at Barbie.com, and will now fill Ken® doll's shoes as Barbie® doll's new "boyfriend", with Mattel promising "they're gonna have the raddest times together!" Pet: "No time for pets, dude!" There was another choice as well...having Cali Barbie® "stay single". All of the voting choices were neck-to-neck, with over a million votes recorded. The vote, like the Cali Girl™ PR campaign follows a carefully crafted script that tetters on making a big splash or belly flopping. An advertising campaign starts in June 2004 on television featuring the Cali Girl™ dolls. Like simmering pots, Ken® collectors have been sitting on the stove wondering where this campaign of terror will lead, and after viewing the brief commercial, at least in my case, the pot has finally boiled over. Time will tell if this type of advertising will play well with the core market, which is really what matters most to Mattel. 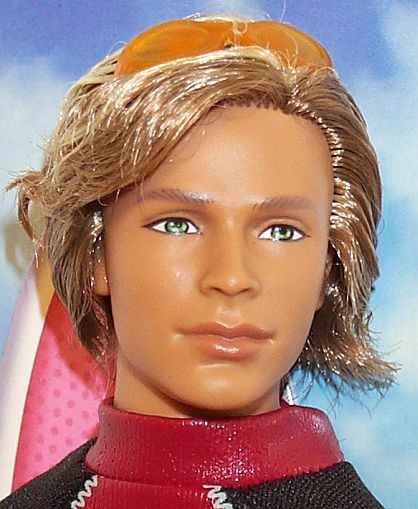 I strongly advised to skip watching the commercial if you have any respect for Ken® doll. For me, it was like watching 43 years of dignity, and five years of creating a niche for Ken® collectors come crashing down in 30 (or was it 15?) seconds. The commercial is similar to the "Charles Atlas" ads found in the back pages of comic books from my generation. Blaine™ is Charles Atlas, and Ken® is the guy getting sand kicked in his face. You get the picture...the commercial represents a lifestyle change, not a style change, and it portrays Ken® doll unfavorably. The Cali Girl™ line is obviously about living in the moment of what's popular, with no respect to lifetime play line memories. To be successful, it will require turning bread and butter into bread and mustard. These feeling can best be summed up by a post on the Barbie Collector.com bulletin board by user "kendu" who posted, "I do think that the current Cali-Girl ad campaign is a nasty example of reverse sexism. Barbie and Ken are not depicted as a nice couple who decide to see other people. Barbie is depicted humiliating Ken in public, mildly assaulting him, and taunting him with news of her new beau. Even worse, the recent Cali-Girl voting contest depicted Barbie flirting with four different men: ex-beau Ken, new guys Blaine and Diego, and old pal Steven. Now I know that Steven was never specifically anyone's boyfriend, but I think that a lot of people paired him with Christie or Teresa. But the current ad campaigns eliminate the idea that Christie, Teresa, or Lea, could possibly have boyfriends. The only males in the line are potential dates for Barbie. They can't date anybody else, but Barbie can date anyone she wants. It's like she has a harem. This is not progress in my book, and I refuse to believe that it mirrors "acceptable" behavior among today's teens. Mattel would never get away with broadcasting an ad showing Ken dumping Barbie in the same way she dumps him, nor would they depict Ken dating several of Barbie's gal pals, even though several exist. What's bad for the gander should be bad for the goose". But you have to admit...Cali Girl™ Blaine is a hottie! M#: H4476 BD: 2003 HC: Two Tone Rooted Medium Blonde/Light Brown. C: Pieced white with navy/white tropical print (sides) board shorts. Pieced navy with light blue sleeves nylon baseball style surf top with appliqué l/s. "Blaine®" wrist tag. A: None. NOTE: SSE, that is shrink-wrapped together with Barbie doll Model #C6461. The fashion includes accessory pieces identical to ones included in Model #C6792. M#: G8667 BD: 2004 HC: Two Tone Rooted Ginger/Light Blonde. C: Beige w/ brown dip-dye palm print board shorts with brown string (at waist). Pieced brick red color with black sleeves nylon baseball style surf top with appliqué s/s. Frost goldenrod sunglasses (attached to head). A: Multi-color chipboard surfboard. White plastic with sticker suntan lotion bottle. NOTE: Doll is scented like suntan lotion. M#: G8667 BD: 2004 HC: Two Tone Rooted Ginger/Light Blonde. C: Same as above. A: Same as above. NOTE: Doll is scented like suntan lotion. First Edition doll box is clear plastic on all sides with flower shape holes on the right and left sides. Second Edition doll has a cardboard panel on the left and back side, and the holes on the right side are now circle shaped. M#: J0699 BD: 2005 HC: Two Tone Rooted Ginger/Light Blonde. C: Pieced orange (right side)/white multi-color print (left side) board shorts with attached white multi-color print and blue flap pocket (right side). Medium blue t-shirt s/s with navy lines and sun applique. Clear aqua sunglasses (attached to head). A: Copper plastic with sticker suntan lotion bottle. Blaine, Barbie, Nichelle, Tori, Ana, Chelsie, Lara, Mari, Jamal, Steven, Todd, Kevin, Ken, Rockers, Generation Girl, International High and Cali Girl/Guy are all registered trademarks of Mattel, Inc. These pages are neither affiliated with, nor a representative of Mattel, Inc. Material provided on these pages do not in any way reflect the opinions of Mattel, Inc.